Pope Francis is on his first trip to Mexico. On his way to meet with the president of Mexico, he first stopped Saturday morning to greet the elderly, kiss babies and bless the sick on the streets of Mexico City. But in a country that is majority Catholic there isn’t a lot of faith that he will make a difference. The value of the peso has plummeted to 5 cents, the approval rating of Mexico’s president Enrique Peña Nieto is at an all-time low and the disappearance and presumed killing of 43 students has yet to be solved after more than a year. Forensic experts say the government’s report of what happened to these students is false. There is so much cynicism and lack of faith in the government and in the Catholic Church that some Mexicans told me in a recent visit to Mexico City that they had more faith in the notorious drug lord Joaquin “El Chapo” Guzman than they did in the pope or the president. “I trust more in El Chapo than in the pope or the president,” said Mario Alberto, 27, a waiter in Mexico City. Irene Ramirez, 32, a nurse in Mexico City said El Chapo does more for the poor in Mexico. "He has done more for this country than Peña Nieto," she said. "I mean he helps people, economically speaking." There is a sentiment among some Mexicans that at least El Chapo is honest in his business. He is transparent and doesn’t hide that he is a drug lord or a killer. There is little faith in the government to solve any of the country’s problems, or to even capture and hold El Chapo, who has escaped twice from prison. Some Mexican Catholics still don’t trust the church after the priest abuse scandal. While around 80 percent of Mexicans are Catholic, some say their faith is more spiritual. 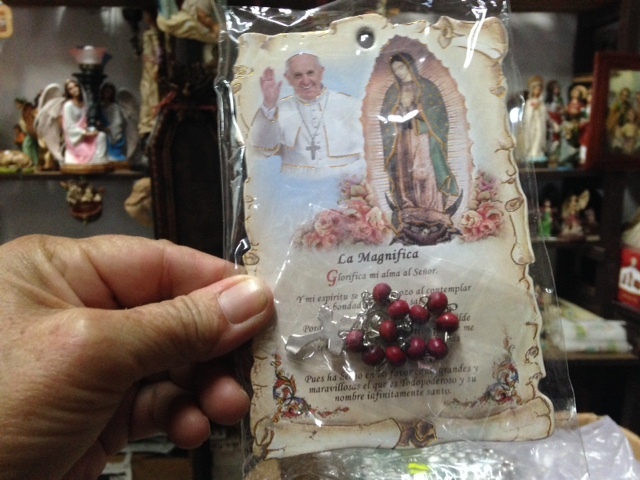 Some also told me they believe more in the Virgin of Guadalupe, Mexico’s patron saint, than in Pope Francis. The pope is expected to visit the Basilica of Guadalupe Saturday afternoon. On a recent afternoon, David Peña and members of his church from the state of Tabasco, visited the shrine to the Basilica of Guadalupe. They made a 12-hour bus trip to pay homage to the Mother of Mexico. “The Virgin of Guadalupe, she is like our flag. She is who we really respect in this country,” Peña said. Pablo Sosa, 42, said many Mexicans don’t like that the pope will meet with the president of Mexico. More than 100,000 Mexicans have been killed and more than 25,000 disappeared in the drug war since 2006. This has eroded the faith of many. And fewer Mexicans, especially youth, are devout Catholics. “I’m not really Catholic, almost not at all,” said Jesus Chavaria, 21, of Mexico City. “I follow some of the traditions but not the rules of the Catholic Church." After spending the weekend in Mexico City and the state of Mexico, the pope will on Monday travel to Chiapas, a state that was the center of the Zapatista movement that surged more than 20 years ago and also is home to a largely marginalized indigenous community. He will then travel to the colonial Mexican city of Morelia, and he will end his trip in Juarez at the U.S.-Mexico border, where he is expected to have a message for immigrants.